Tucked away in the very far corner of South West Cornwall is the charming little town of Marazion with only 1,500 inhabitants. This ancient market town is believed to be Britain’s oldest chartered town. Aside from being steeped in history, this picturesque town is best known as the location of St Michael’s Mount. Marazion is situated in a prominent position on the shores of Mount’s Bay, which is recognized as one of the top ten most beautiful bays in the world. The town has an excellent safe sandy beach, and is loved by those interested in outdoor activities like hiking, water sports and bird watching. Twice a year thousands of starlings roost in the RSPB Reserve at Marazion Marsh. The arrival of the birds at dusk is a truly spectacular sight. The Marazion Museum has an informative booklet entitled “A Walk Round Marazion”. This 3/4 mile walk centres on the oldest part of the town. The walk starts at the impressive Town Hall which was once the Market House, town jail and fire station. It now houses the Town Museum. From the Town Hall, the walk takes you past buildings such as the Shambles, or meat market, the Old Police House and the War Memorial which was erected to commemorate the dead from the two world wars. It then continues around the back of Marazion from where you’ll have a panoramic view of the bay from Cudden to Mousehole. This walk takes approximately 40 minutes. Marazion is a good base to explore Cornwall – with plenty of affordable accommodation, shops, pubs and bakeries offering a range of food and drink options. Visitors can experience the true Cornish lifestyle in a comfortable and beautiful setting. Marazion has a long historic relationship with the island and castle of St Michael’s Mount, one of the most famous Cornish landmarks. The highlight is the castle which is set atop the mount on a separate island – it’s possible to walk to the St Michael’s Mount during low tide, but at high tide a ferry ride is required. The castle itself is quite enchanting and visitors can amble through the many furnished rooms and enjoy the panoramic views. The Mount was dedicated to St Michael who, according to legend, appeared here in 495. Both St Michael’s Mount and Marazion are main attractions of Cornwall. 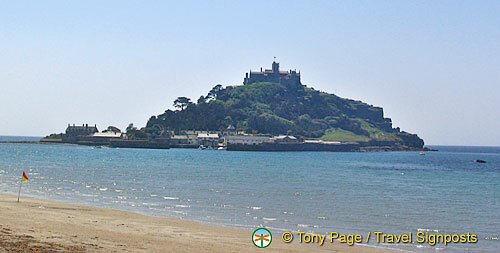 See more St Michael’s Mount and Marazion photos in Travelsignposts photo gallery HERE.